You want your business to grow. Be profitable. And stay competitive. Having a robust network is key to your success. Cisco is the worldwide leader in technology. Our SMB portfolio delivers the reliable, scalable, and highly secure IT infrastructure that your business needs. Staying ahead of market trends is vital to the success of your business. 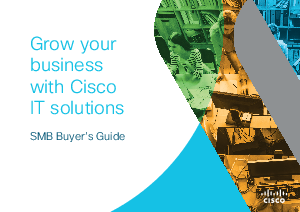 Cisco can help keep your business on the move while helping to secure your data, devices, and infrastructure. To find out how, download this whitepaper today.